Healthy snacks can help manage blood sugars by providing a steady supply of energy through the day and help curb hunger. That means choosing foods wisely. Try to include 1 carb choice (15g) plus add a serving of protein. A lot of proteins have a serving a fat included which is good because healthy fats are important. 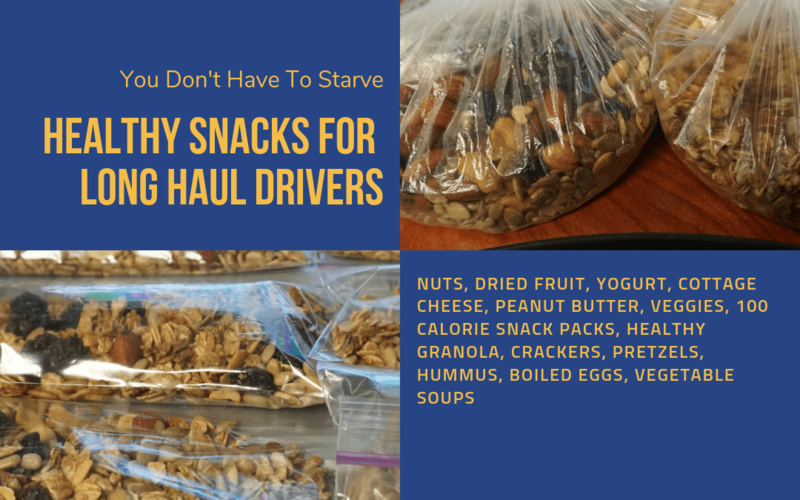 Eating multiple small meals throughout the day, while you’re driving, is an easy and quick way to keep yourself from binge eating and/or over eating all at once. Also, eating out of boxes and bags can quickly lead to overeating. Choose raw veggies like baby carrots, celery sticks with peanut butter, dried fruit (sparingly), 100 calorie snack packs, healthy granola bars, healthy whole grain crackers and cheese, pretzels and yogurt ranch dressing, salty nuts, hummus and pita chips, boiled eggs, string cheese and even vegetable soups. Hydration is absolutely critical in a healthy diet. Most drivers are no stranger to relieving themselves in empty bottles, let’s just make sure those bottles are water bottles and NOT MOUNTAIN DEW OR ENERGY DRINK BOTTLES! While you are refueling, see how many jumping jacks you can do. Running in place and even jump rope while refueling is a great idea to get exercise in while on the road. We hope this material helps you and folks you know strive towards health and wellness.